These were dusted off/remade last night. 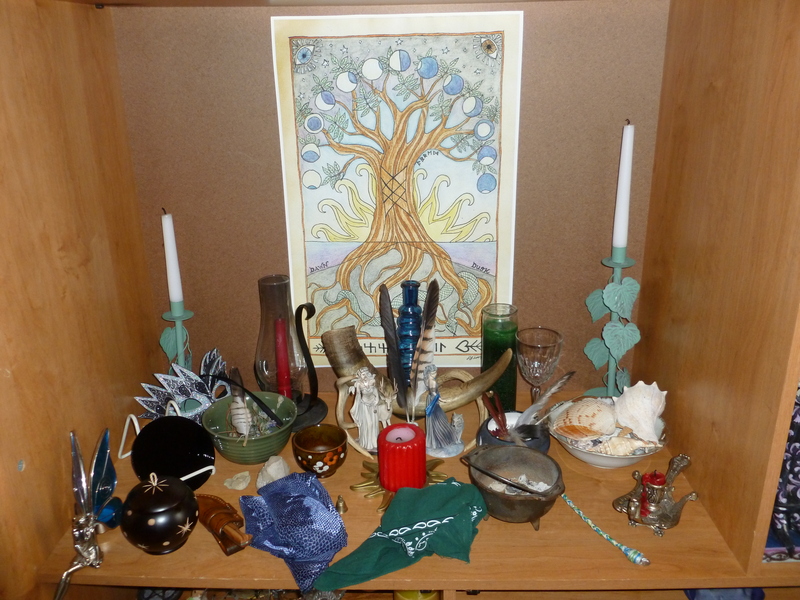 Sadly the amount of space I have to set up any altars or shrines is all squashed into my bedroom, so room is limited. 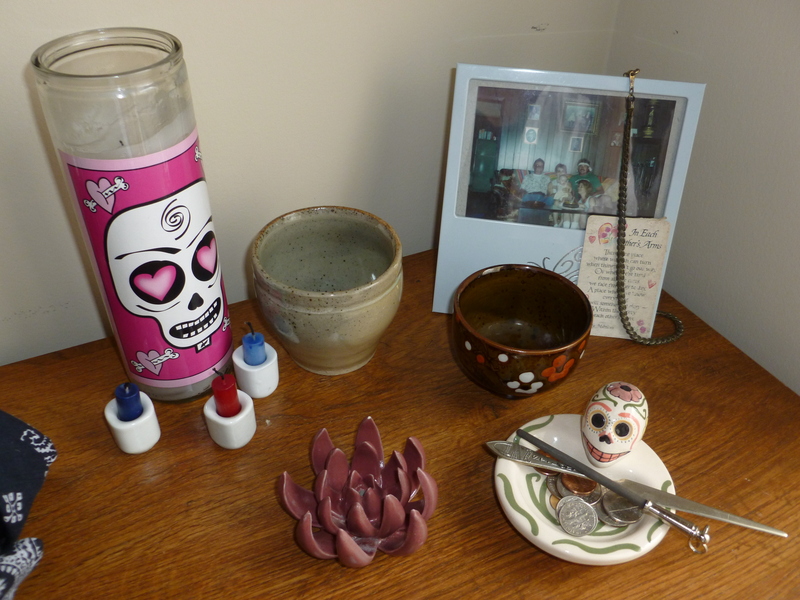 This is my ancestral shrine. 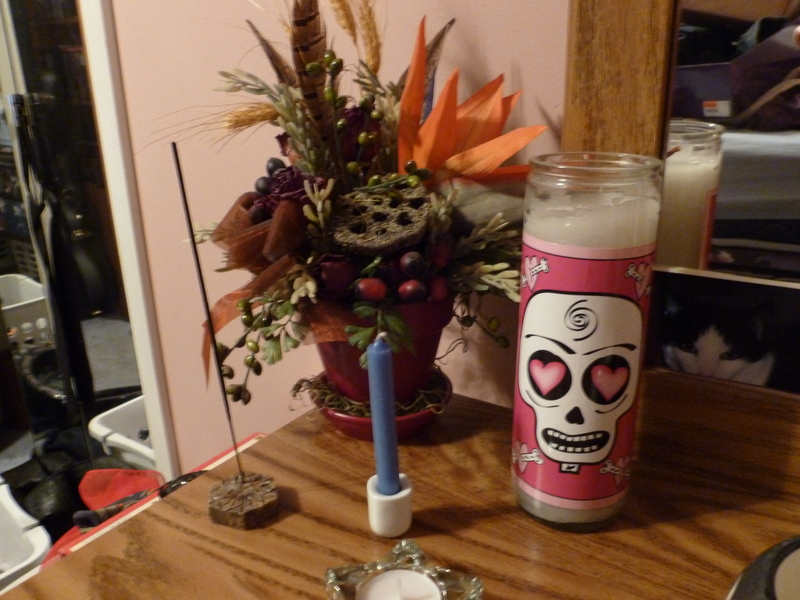 The incense is patchouli, the large candle was a unique gift given years ago to me. The potted plant is a dried/faux flower arrangement given to me that contains dried roses from my father’s funeral in ’03. 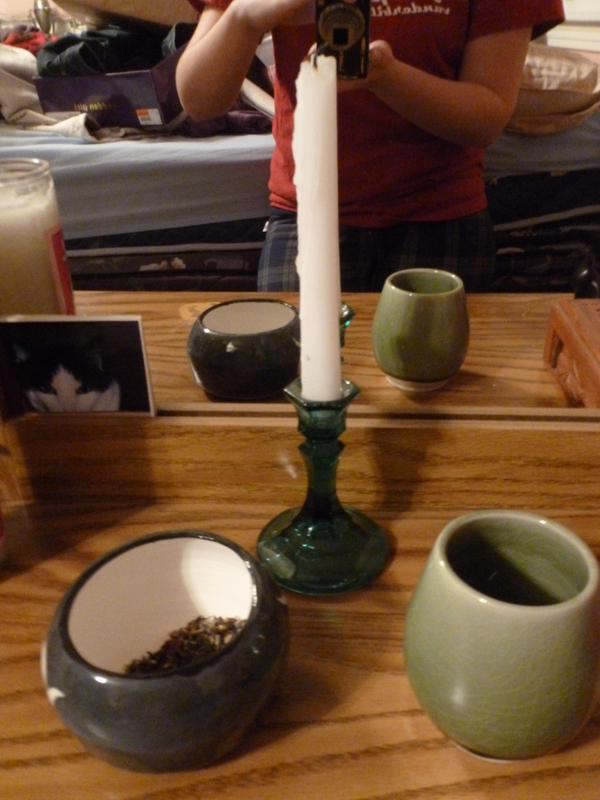 The picture on the corner of the mirror is my deceased kitty, and I hope to have something up soon to honor my grandfather. This sits right next to my ancestral area, just an area to calm my mind and honor the general awesomeness of the universe. This is my general altar to the God, the masculine, and the wild. It’s not yet claimed by a specific God. The bull horn was recently purchased, the incense burner an old one of my father’s, one of the few things I have from him. 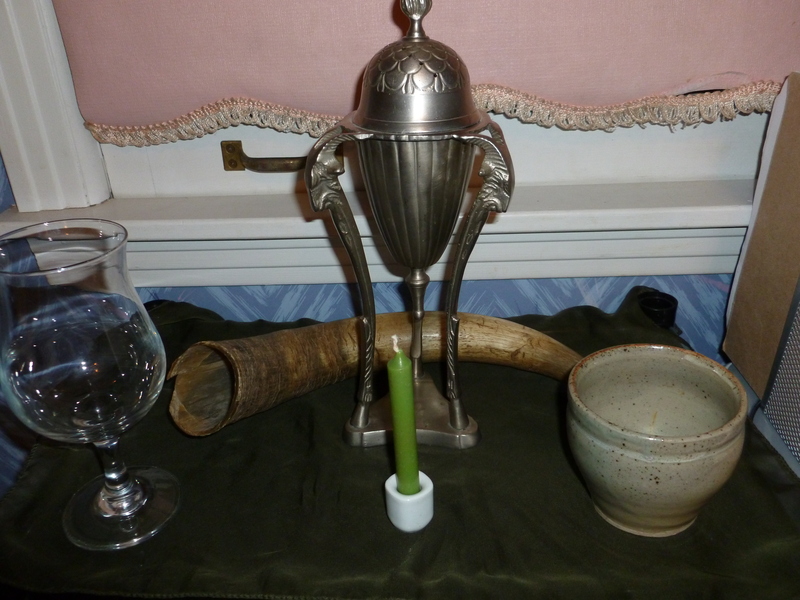 If I keep it as a general altar I may put my deer horns on it too, but I’m hoping a specific god will come to it, or perhaps I’ll make it a shrine to honor Dionysos. 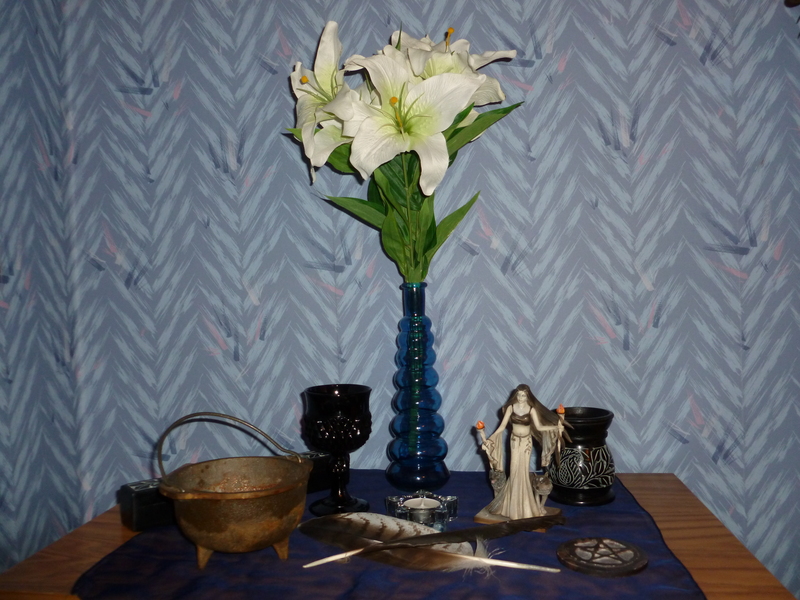 I’ll write up a post later on why I decided to bring back my small Hekate’s shrine. 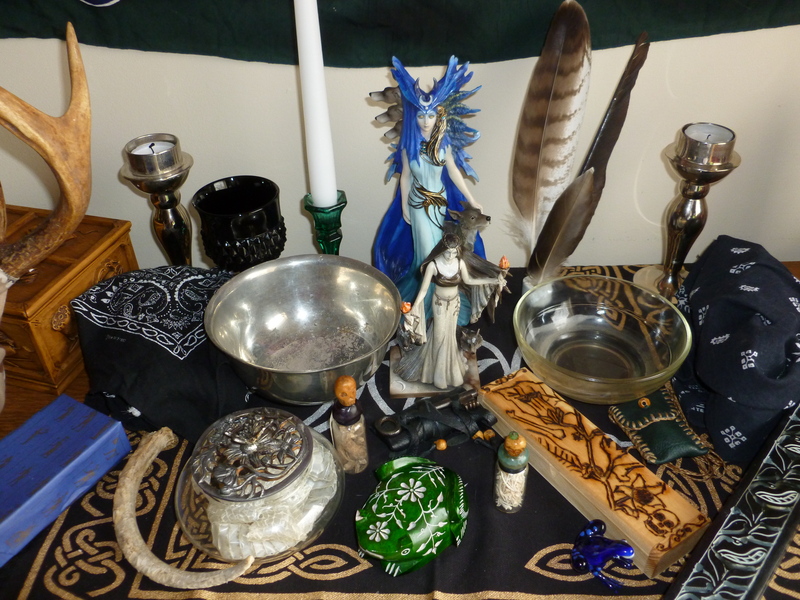 I recently had an experience that made me realize that she IS in my life, and while there may be other goddesses who will become present as well, Hekate must be honored. The cauldron needs to be cleaned, not sure how I will yet. Only dry offerings will be placed in there anyway for now. The statue is the only one I have at the moment of her, although I really really want the Maxine Miller one, definitely my favorite that I’ve seen and on my list of objects to purchase. The feathers are owl and some sort of corvid (the latter was found, former a gift). I’ll have to say that this and the ancestral shrine currently hold the most attachment for me, but all will of course change over time. These were all quickly constructed, basic areas.